Although the 'Jordan' part of the brand name refers to legendary British speaker designer Ted Jordan, famous for his full-range metal-cone drive units, ALR Jordan is actually German. The company was in fact, originally founded by equally legendary speaker system designer Karl Heinz Fink. This £800 per pair Entry XL is the top model of four stereo pairs that make up ALR Jordan's least costly Entry range. It's a d'Appolito two-way floorstander; a configuration that uses twin bass/mid drivers mounted above and below a solitary tweeter. Interestingly, said tweeter is slightly offset from the exact mid-point between the two bass/mid units. However, since it's just 10cm taller than the Entry L, and has just one extra bass/mid driver, the £300 price premium of the XL over the L does seem rather steep. The appearance is prosaic, with a rectangular box that in our case had an attractively sparkly charcoal grey front, and a less convincing beech vinyl woodprint elsewhere; but silver and black are also optional finishes. The main drivers here have 165mm cast frames and 120mm Jordan-designed aluminium cones, while the tweeter has a 25mm soft fabric dome. A large port is set into the front panel below the driver array, and foam bungs are supplied to block these if desired. A single terminal pair feeds a 24dB octave (acoustic) Linkwitz-Riley crossover network that uses low loss 'audiophile grade' capacitors and, unusually, an autotransformer (instead of resistors) to set relative treble level. Reversible spike/domes are supplied for floor coupling, locked by thumbwheels that have flats to allow proper spanner tightening. However, there's no separate plinth to improve either the appearance or the stability. Given the significant drive unit area, enclosure volume and port diameter, it's hardly surprising that the Entry XL is best suited to free space siting, well clear of walls. That said, the port output seems to pretty well controlled and the overall bass alignment is quite dry, so some closer-to-wall reinforcement might be appropriate under some circumstances. Frankly, those bungs are unlikely to be useful unless circumstances dictate that the speaker has to be sited hard up against a wall. First impressions were very positive, the speaker delivering music with superior coherence, good transparency and a fair measure of dynamic life and expression. Timing is particularly deft here, and the Entry XL certainly manages to capture some of the agility and deftness associated with good-quality standmounts. Speech is reproduced very well, albeit warm and with a measure of hollow coloration, while the presence is beautifully integrated, if laid back. The overall tonal balance is basically good, if lacking in bottom end weight and welly, while the top end is too strong and obvious, though acceptable enough because of its innate sweetness. Imaging is good with fine focus and good depth, though air and spaciousness is somewhat limited, presumably because the acoustic centre is set below seated ear height. 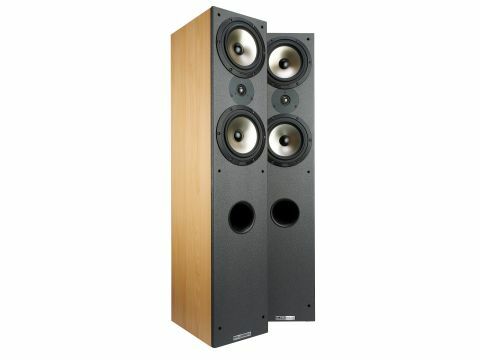 Purely in terms of sound quality, the Entry XL is a good loudspeaker at a realistic price. But with speakers, the reviewer also has to take account of the presentation quality, and here the value rating is less impressive. Furthermore, it's difficult to see why one extra drive unit and 10cm of enclosure should end up costing more than half as much again as the Entry L.